Dallas: Corporate-jet makers are flooding the market, spurring deep discounts for new aircraft and fuelling a three-year slide in prices of used planes. Most major manufacturers, including Gulfstream and Bombardier Inc — which is also contending with rising hurdles in its commercial-jet business — have slowed production in the last couple years as demand for private jets sagged. That still hasn’t been enough to halt declines in aircraft values, say consultants, brokers and analysts in the $18 billion industry. Gone is the optimism stoked by the election of President Donald Trump, a corporate-jet maven with his own Boeing 757, along with hopes for speedy tax cuts that would bolster plane purchases. Instead, the news has been full of setbacks. US Health Secretary Tom Price resigned under fire for his frequent use of private planes at taxpayer expense. General Electric Co is selling off its corporate fleet to cut costs. “The Trump bump is over,” said Janine Iannarelli, a Houston-based plane broker. The jet glut is one reason pre-owned prices were down 16 per cent in August from a year earlier. With bargains aplenty on machines with few flight hours, manufacturers are cutting deals to entice buyers to purchase new planes. Meanwhile, they keep churning out aircraft and introducing new models. A rise in demand for new company planes, which would help stabilise the market, isn’t in the cards. Corporate plane-buying plans have hit a 17-year low, according to an annual survey by Honeywell International Inc of more than 1,500 flight departments. Companies expect to replace or add planes equivalent to 19 per cent of their fleets on average over the next five years, down from 27 per cent in last year’s survey. The steep discounts on new aircraft are galling customers who paid closer to a full price, said Barry Justice, founder and chief executive officer of Corporate Aviation Analysis & Planning Inc General Dynamics Corp’s Gulfstream unit slashed as much as 35 per cent off the price of its G450, which is being phased out as the new G500 aircraft nears arrival, Vincent said. 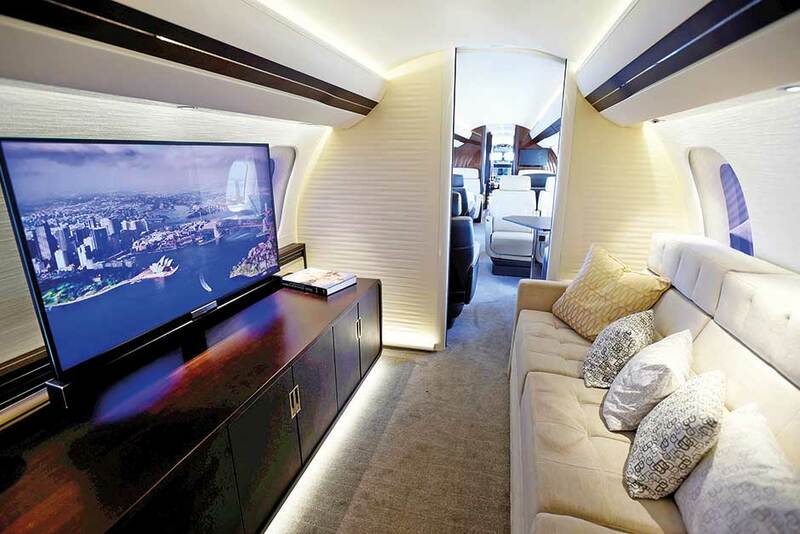 The G450 had a list price of about $43 million (Dh157.9 million), according to the Business & Commercial Aviation guide. Bombardier has offered discounts of as much as $7 million on the Challenger 350’s list price of about $26 million as it fends off competitors entering the super mid-size space, he said. The weakness across the industry in private-jet sales is adding to the pressure on Bombardier, which is also struggling to sell its C Series commercial planes. The US government slapped import duties of about 300 per cent on the single-aisle jetliner in the last two weeks after a complaint by Boeing Co.
For corporate aircraft, the global market hasn’t fully recovered from the last US recession, when plunging demand popped a bubble that had flooded the industry with more than 1,000 new jet deliveries in both 2007 and 2008. A nascent recovery in 2013 and 2014 fell apart after the price of oil and other commodities collapsed, drying up sales in emerging markets such as Russia and Brazil. Deliveries of new private jets are forecast to drop to 630 this year, down from 657 last year and 689 in 2015, according to JPMorgan Chase & Co. The number is forecast to rebound slightly to 640 in 2018. The more conservative pace has done little to relieve the glut, creating a buyer’s market for used aircraft. A five-year-old jet sold in 2016 was worth only 56 per cent of its original list price, on average. That’s down from 64 per cent in 2012, according to a report by Jetcraft, a plane broker that expects to close more than 80 deals this year. The value retention was as high as 91 per cent in 2008. Prices for used aircraft right now are “insane,” said Justice. Some companies and wealthy individuals are buying pre-owned aircraft for the first time because the bargains are too good to pass up, he said. More new aircraft are on the way. Next year Bombardier will begin selling the Global 7000, which will compete with the Gulfstream G650ER as the largest and longest-range business jet. Textron Inc’s Cessna unit is close to beginning deliveries on a super mid-size plane called the Longitude and is designing its largest-ever aircraft, the Hemisphere. Gulfstream will begin selling the G500 early next year and the G600 later in 2018, both of which are large-cabin aircraft. Smaller aircraft are feeling the pressure as well. Swiss planemaker Pilatus Aircraft Ltd is set to begin sales of its first business jet — the PC-24 — building on the success of its single-engine turboprop. HondaJet began deliveries at the end of 2015, the first-ever business jet for the Japanese carmaker. Those new models should help boost new aircraft sales because they will offer better performance and newer technology than the pre-owned models, which compete for buyers mostly on price, said Ben Driggs, Honeywell Aerospace’s president for the Americas. “We are projecting growth in ’18 and growth in ’19 and beyond” for new aircraft deliveries, Driggs said. Bombardier pulled back production rates in 2015 after its inventory of new jets began to pile up. The slower pace helped the Canadian company boost operating margins and support pre-owned prices of its planes, spokeswoman Anna Cristofaro said in an email. Bombardier’s sales from business jets were more than twice its revenue from commercial planes last year. “Our actions in 2015 have yielded results, and Bombardier’s young pre-owned Global model aircraft continue to be among the top performers in the large category in terms of value retention and pre-owned inventory levels,” Cristofaro said. That’s a step in the right direction. But the market as a whole will have to wait a little longer for relief.